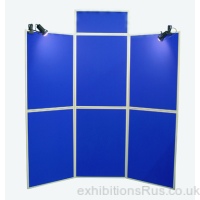 Ideal solutions for a variety of display stand requirements for smaller events and presentations. 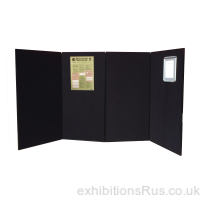 Folding displays are often put to good use in Schools, Colleges and Universities, Council offices, Shopping centres, conferences and showrooms. 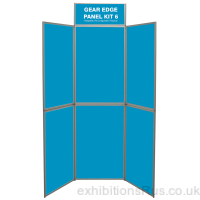 The folding panel stand offers a very quick and easy presentation solution together with a vast choice of colours for fabric covering and either grey or black Pvc trim. 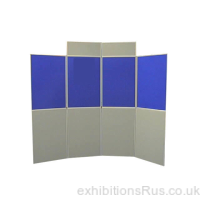 Our folding systems provide dependable quality using a warp resistant thicker honeycomb board in the manufacture of our panel systems and a tough Pvc flexible hinge to allow panel to fold back on each other for packing away between usage at events. 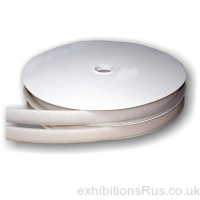 UK manufactured to the highest standards and class 1 fire rated. 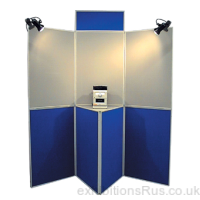 These folding display stands are supplied without feet and need some angle in the displays setup to provide support to the stand, ie you will not be able to use them in a straight line, please consider a panel and pole display stand for this style of configuration. 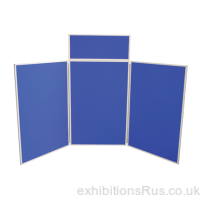 Premium panels are 15mm in thickness. 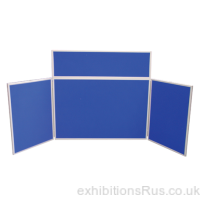 Stock is held in blue / grey panels, popular sizes. 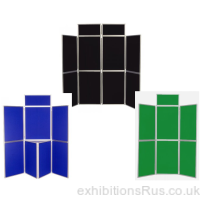 Other coloured systems will be made to order and could take 5 days to supply, please call if a confirmed supply time is required, 01256 768178.